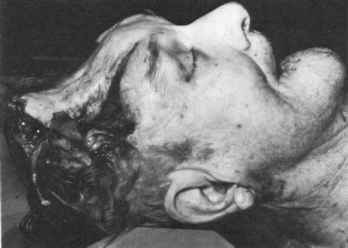 Tangential wounds of the skull have classically been called "gutter wounds. "19 In first-degree gutter wounds only the outer table of the skull is grooved by the bullet, with resultant carrying away of small bone fragments. In second-degree wounds pressure waves generated by the bullet fracture the inner table. 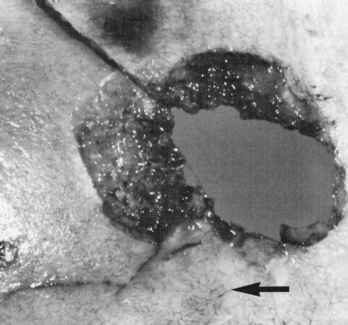 In third-degree wounds the bullet perforates the skull in the center of the tangential wound (Figure 4.40). The outer table is fragmented, and there are depressed fragments of the internal table if not comminution and pulverization of both tables in the center of the wound track. Fragments of bone can be driven into the brain causing death. After third-degree wounds come "superficial perforating wounds." Here there is production of separate entrance and exit wounds in the bone. A low-velocity bullet may strike the skull at a shallow angle such that it does not penetrate but rather flattens out, forming a thin oval lead disk. The bullet may then slide along the surface of the skull beneath the scalp. When this occurs, this usually involves a .22 Short bullet. A bullet striking the skull at a shallow angle may produce a punched out oval defect in the skull without the bullet actually entering the cranial cavity. The bullet may flatten out and either be recovered from beneath the scalp or exit. The fragments of bone may be driven into the brain and cause death. Figure 4.40 Gutter wound of bone. Figure 4.41 Keyhole wound of bone. Arrow indicates path of bullet. the external beveling of a wound of exit.20 In a less common variant of keyhole wounds, the bullet does not split but enters the cranial cavity intact. This type of keyhole wound is common with full metal-jacketed bullets. The exit aspect of the bony defect is do to pressure waves generated by the impacting bullet lifting and breaking off the bone at the exit end. Bullet wounds of the head may produce cerebral injury and death without entrance into the cranial cavity. Thus, the author had a case of a 65-year-old white male who shot himself in the ear with a .32 revolver. 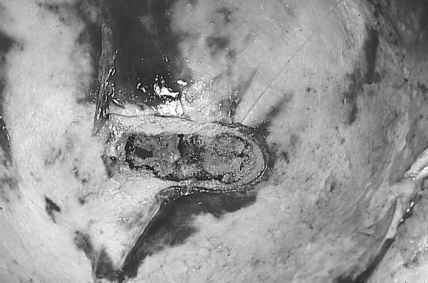 The bullet traveled through the petrous bone before coming to rest adjacent to the sella turcica. Although the bullet caused extensive comminuted fractures of the petrous bone, it did not enter the cranial cavity. The dura overlying the petrous bone was intact. Examination of the brain revealed extensive contusions of the ventral surface of the temporal lobe overlying the bone. No lacerations of the brain were present. The production of secondary fractures of the skull due to intracranial pressure waves is dependent on two factors: the range at the time of discharge and the kinetic energy possessed by the bullet. The most common sites for secondary skull fractures are the paper-thin orbital plates. These are extremely sensitive to a sudden increase in intracranial pressure such as that produced by a bullet entering the cranial cavity. Secondary fractures are very common in contact wounds of the head. This is due to the gas produced by discharge entering the cranial cavity, expanding, and contributing to the stress placed on the bony chamber by the temporary cavity. The more gas produced, the more that enters the skull and the more likely that the fractures will be produced. An extreme example of this is provided by contact wounds from a centerfire rifle or shotgun. These weapons cause explosive wounds of the head, with large fragments of bone and brain typically being ejected from the head. In distant wounds, gas plays no part in the production of fractures. These fractures are produced by the pressure built up in the skull as a result of temporary cavity formation. The size of this cavity is proportional to the amount of kinetic energy lost by the bullet in its passage through the head. The greater the amount of kinetic energy lost, the larger the cavity; the larger the cavity, the greater the pressure produced on the walls of the cranial chamber and the more likely a fracture is to occur. Thus, secondary skull fractures are rare with wounds inflicted by a low-energy .22 Short cartridge, but are the rule with wounds from a centerfire rifle. With the .22 Short cartridge, fractures are usually limited to the orbital plates. Although secondary skull fractures are uncommon with .22 Short ammunition (even in contact wounds), .22 Long Rifle cartridges usually produce secondary fractures in contact wounds and not uncommonly in distant wounds. The fact that the fractures in a skull are due to temporary cavity formation was demonstrated by a series of experiments with skulls.16 When the skulls were empty, the bullets "drilled" neat entrances and exits without any fractures. When the skulls were filled with gelatin to simulate the brain, massive secondary skull fractures were produced. On occasion one will be presented with what initially appears to be a perforating gunshot wound of the head but in fact is a penetrating wound. There will be both an entrance and an "exit" wound in the scalp. The autopsy reveals the bullet still to be in the head. What happens is that the bullet, after perforating the brain, strikes the opposite side of the skull with sufficient force to fracture it and propel a piece of bone out through the scalp. The bullet itself had insufficient velocity to exit the head. In a variation of this involving semi-jacketed ammunition, the lead core exits while the copper jacket remains. Rarely, the jacket exits and the core remains. This again points out the need for x-rays in all gunshot wounds of the head.